Victory! United Methodist Conferences, representing thousands of churches, vote to Divest! United Methodists and allies demonstrate for divestment outside the 2012 General Conference. Big news! 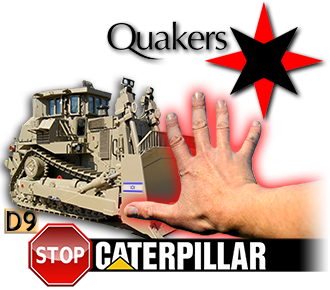 United Methodist annual (regional) conferences in New England, Minnesota, Pacific Northwest and Upper New York voted this month to divest from companies involved with Israel’s occupation of Palestinian land including Caterpillar, Motorola Solutions, Hewlett Packard, and General Electric. They joined conferences in West Ohio, New York, Northern Illinois, California Nevada and California Pacific which have already taken similar action. This brings the total to nine regional bodies representing thousands of churches nationwide! Click here to thank the United Methodist conferences for voting to divest! And that’s not all! At least five other conferences — Virginia, Rocky Mountain, North Central New York, Baltimore Washington, and Detroit — have called on the United Methodist Church’s General Board of Pension and Health Benefits to divest its millions of dollars in holdings in companies that profit from the occupation. Two more conferences, Susquehanna and Eastern Pennsylvania, established official task forces to examine the issue. Wait — there’s more! In March, the Mennonite Central Committee U.S. unanimously decided that — effective immediately — it will not invest knowingly in companies involved in the Israeli occupation.” They adopted the investment screendeveloped by the American Friends Service Committee, which includes the aforementioned companies and more than two dozen others. And last year, Friends Fiduciary Committee, which handles investments for hundreds of Quaker institutions, divested from Caterpillar, Hewlett Packard and Veolia Environment. These major divestment victories are critical with Israel’s ongoing settlement expansion and ever-worsening attacks on Palestinian men, women, and children. Just yesterday, the Israeli Knesset approved the first reading of the Prawer Plan, a blueprint for displacing 40,000 Bedouins. Please thank the United Methodist conferences now for saying YES to divestment! Last year, hundreds of people like you around the world mobilized to support member group, United Methodist Kairos Response, in its efforts to align the church’s words with its actions by divesting. While divestment didn’t pass at General Conference, these recent votes show unequivocally that the tide is turning, church by church, conference by conference, from the ground up. Congratulations to all who have played a role in these efforts! Are you also part of a faith community and interested in pursuing boycott or divestment? Check out the Interfaith Boycott Coalition and sign the petition “Thirsty for Justice” to be connected with ongoing efforts today! If the Jews, Christians and the Muslims believe in God, then they must also believe that all horrifying injustices Israel is perpetrating against helpless people, would one day be punished by the same God who sent his commandments that Jewish people once before in the history ignored and were expelled from God’s favor!